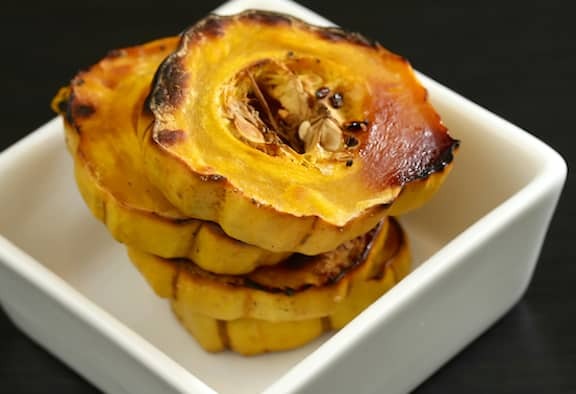 Delicata squash is delicious any way you slice it. Delicata, acorn, and butternut are three of my favorite varieties of squash. For delicata, wash it, cut it in half from top to bottom, then scoop out the seeds from each half with a spoon and slice into half-inch pieces. This squash is delicious simply steamed in a little water. Contributed by Meg Wolff, from A Life in Balance,* ©2010, Down East Books. Spread the thinly sliced squash on a parchment-lined or lightly greased baking sheet (I use olive oil), and drizzle a couple of tablespoons of brown rice syrup over the pieces. Sprinkle with a tablespoon of olive oil, tamari, and then with the sea salt. Top with chopped walnuts or pecans and bake about 30 minutes.